This is not a real eclipse. 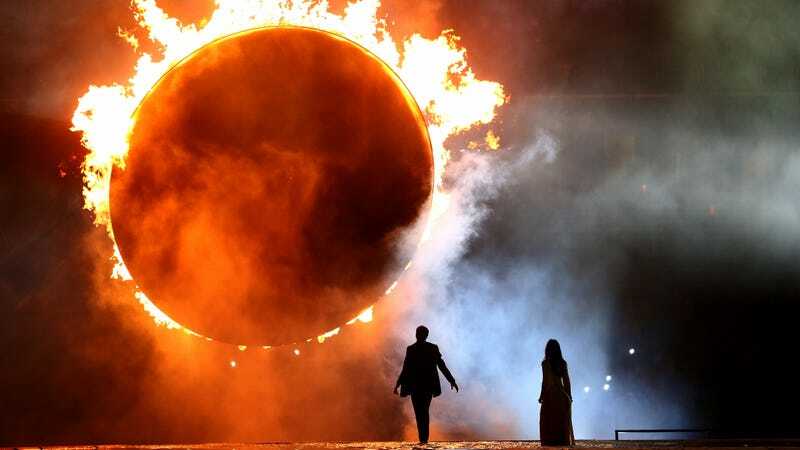 It’s a ring of fire representing a total solar eclipse, from the Opening Ceremony for the Baku 2015 European Games.If you’d like, you can stare directly at it. Photo via Getty Images. As you’ve heard, there’s a Total Solar Eclipse happening today at various times across the land, with varying visibility. We know what will happen: the moon will totally cover the sun as it makes its amazing orbital journey through the universe—an event rare for humans to witness. Those are just regular glasses! You wonder what all the fuss is about and decide against participating in the ridiculous fanfare. You get a paper cut while faxing a document.